Greetings, friends! We’ve just launched our season of dried beans for the year, and we’re thrilled to be including the first of the new crop in the CSA this week! The dried beans are quite a process, and we wanted to share a bit about it. It all starts with planting in spring followed by laying irrigation tape, “stringing” up the pole beans, multiple weeding sessions through summer, and then the harvest and processing steps in late summer and early fall. That entails cutting the bush bean plants and laying them out to dry and hand-picking the individual pods on the pole beans. Next comes threshing the pods/plants in our small bean thresher. From there, we winnow the beans (remove the chaff from the plants using a fan), and then do a meticulous hand-screening, sorting and cleaning. Here’s a photo of us screening the beans you’ll be enjoying this week! 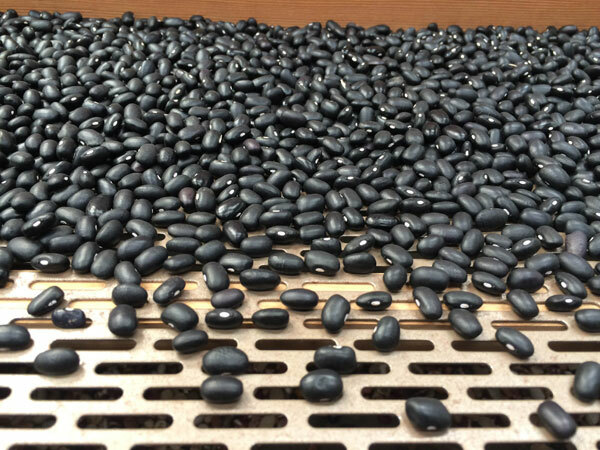 Dried beans: This bean variety called Midnight is a classic black bean. These beans are so fresh at this point that they won’t need a typical overnight soaking that you might normally use with store-bought beans to speed up the cooking time later. If you don’t cook these right away, we recommend not leaving these beans in a bag or jar with the lid closed. Instead, leave them in an open container for at least a few weeks so they can continue drying down (this is a precaution we follow just in case there’s any moisture remaining in the fresh dried beans). Roma tomatoes: New to the CSA, these will make a lovely tomato sauce, marinara sauce, or even a thick salsa. You could even use these to make a savory sauce with some cumin and chili powder and other spices to enjoy with the black beans. Swiss chard: I was reading some info on greens the other day and came across an interesting tip on Swiss chard. The writer noted they don’t normally boil greens, because quite a bit of the nutrition can leach out in the water. But chard, the writer noted, is one green they always like to boil for just 2 to 3 minutes because it releases a certain slightly bitter compound in leaves, increasing the greens’ sweetness. So, lately, I’ve been loving doing a very quick boil of the leaves, and then draining well and tossing with butter or olive oil, garlic, and any other seasonings. Really simple and yummy! Sweet potatoes: Another new crop! So delicious as mashed sweet potatoes, roasted with oil and herbs, or added to soup or chili. Winter squash: We’ll be sharing various winter squash varieties during the autumn weeks. This one is called Sugar Loaf, and it’s a type of delicata. Works well steamed, roasted, or stuffed and baked, and has a sweet, slightly nutty flavor. Can be taken a savory direction, with sausage, onions, etc., or a sweet direction with cinnamon or jam.